1992 U.S. Open 9-Ball Championships . Sept. 20, 1992 . Chesapeake, Va. Number 27 on our list of the greatest final matches from the last three decades didn't come down to one ball for a world championship. It didn't have any game winning two-rail kicks or dramatic scratches. Heck, it wasn't even close. 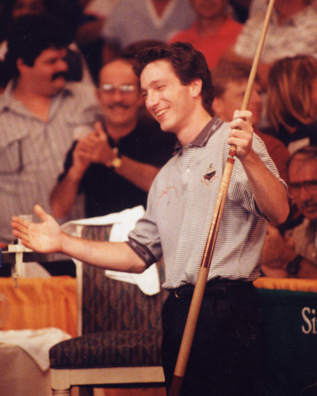 But nobody can question the excitement of Tommy Kennedy completely demolishing Johnny Archer in the final of the 1991 U.S. Open 9-Ball Championship. Kennedy came into the tournament as an unranked touring professional on the Men's Professional Billiards Association. Archer was the hottest player in the world and reigning world champion. So, naturally, Kennedy completely dismantled Archer, winning nine straight after dropping the opening rack on his way to a 9-1 win. And though that score produced plenty of cartoonish double takes, nobody looked more surprised than Kennedy himself. "Praise the Lord!" Kennedy, a born-again Christian, exclaimed over and over as he kept beating increasingly astronomical odds. "This was God's will. I'm totally convinced of that." An obvious underdog in all but his first two matches, Kennedy almost dropped his very first match. Trailing Calvin Coker, 12-11, he closed out the rack to meet his opponent on the hill, then broke and ran to eke into the second round. From then on, Kennedy didn't get any free passes on his way through the winner's bracket of the 64-player field. He topped Jim Rempe in a 13-12 slugfest that won him plenty of fans in the sold-out Holiday Inn ballroom. Then he topped Mike LeBron, Jose Parica and finally Archer to finish his unbeaten run into the U.S. Open final. In front of TV cameras for the first time in his career, Kennedy was clearly overwhelmed. But instead of being swallowed up by the circus atmosphere, the diminutive crowd favorite thrived in his role as the wide-eyed Cinderella. "That was a great safety, Johnny," Kennedy said, draped in sincerity, after an Archer safety. "You hit that like a world champion." Kennedy, along with everyone else, was in disbelief. Even Archer's steely demeanor gave way to a few smiles and a chuckle or two, which might have led to his game's unraveling. Archer took the first rack of the final after Kennedy lost control and missed. From there, however, the world champion could not stay in line. Archer played loose safes and missed several shots. Kennedy regained his confident stroke, building his lead to 8-1. Just one rack away from a U.S. Open title, Kennedy missed on the 1, giving his opponent one more shot. Archer, though, couldn't get in rhythm after being a spectator for long periods of time, and the jarred an easy 8 ball. Kennedy leapt to the table, buried the final two balls and finished a title run that is without comparison in the 32-year history of the U.S. Open. Even as he pulled away from Archer, Kennedy understood the need to stay completely focused until the final ball dropped. "I felt pretty good when it was 8-1," he half-joked. "Then I missed the 1 ball and thought, 'Oh, no!' But I decided if it was God's will, I'd get another shot. And I did. This is so great!"